This obvious Mignon clone has an interesting story to tell, although much of what follows is based on interpretation of scarce facts. This American version of the German Mignon is quite a rare typewriter, that is in fact underappreciated because the Mignon is so common. One of the clauses in the 1918 Versailles Treaty that finalized Germany's defeat in World War I cancelled all German industrial patents. Anything that was based on German patents could be freely copied around the world. 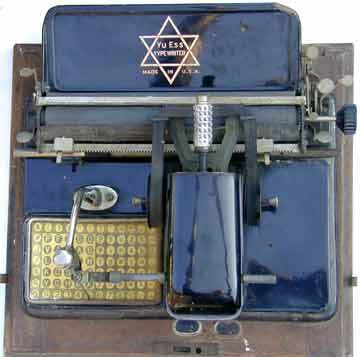 A former employee of the German company that produced the Mignon, Jack Cosman, joined forces with a jewish industrialist, Lucius Littauer, and W.P. Hatch, one of the former inventors of the Elliott Hatch book typewriter, to produce this successful German machine for the American market. The Yu Ess was marketed, primarily in the New York area, for two years only. And although serial numbers run into the 50,000s, only a fair dozen machines have survived, all with serial numbers between 50,000 and 52,000. It is clear that no more than 2000 of these machines were ever built. What seems to be most likely is that the idea behind the market strategy of the Yu Ess was to sell it to the rapidly growing community of European jewish immigrants in the New York area. 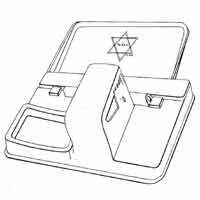 This would explain the Star of David logo on the machine. The small target audience would also explain why the venture failed. It was long thought that the Yu Ess was in fact a German product that was marketed under the Yu Ess name to hide its origine. Although at first glance the machines seem to be identical, there are in fact many mechanical differences between the Yu Ess and the Mignon, including differences in the frames. Picture 6 shows some of these obvious differences between the Mignon (left) and the Yu Ess (right). The Yu Ess patent as granted to Jack Cosman. However, the shape of the cover on this frame was not actually produced for the Yu Ess. The Yu Ess failed on the American market, and the next step was to try and enter the European market with the Yu Ess. Production was taken up in Paris by the Manufacture Française. At that point, the Yu Ess became a competitor of what had already been a major export market for the Mignon. 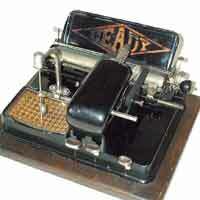 Soon, the name of the machine was changed to Heady in France, and also Stella en Eclipse. This competition on the French market may also explain why the Mignon is found in France in a number of variations that are never seen in other countries. The Mignon 3 and 4 were black typewriters. But in France you could buy them in different colors like white, red, blue and even marbled.